Morecambe players’ piece of good fortune? Morecambe boss Jim Bentley goes into Saturday’s game at Grimsby Town hoping that his players have finally started to have some good fortune. The Shrimps head to Blundell Park, hoping to back up last Saturday’s 2-1 win against Macclesfield Town at the Globe Arena, before travelling to Cheltenham Town next Tuesday. 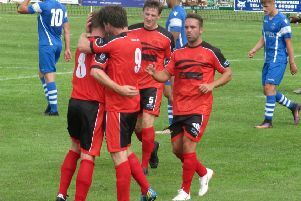 Morecambe celebrate taking the lead against Macclesfield. A-Jay Leitch-Smith and Andy Fleming scored the goals for Morecambe, who had seen their visitors reduced to 10 men in the first half. Former Morecambe captain Michael Rose was shown a straight red in the 37th minute after a wild lunge on Alex Kenyon. Unsurprisingly, Rose and his manager, Mark Yates, did not agree with referee Geoff Eltringham and Kenyon’s withdrawal through injury seven minutes later only seemed to justify the official’s decision. Bentley said: “It may have been more mistimed than aggressive if I’m being honest. “I thought the ref did well; from his angle he might have seen it differently. “We could have had a couple of penalties this year and we haven’t had one. “I know I go on about it but we just don’t seem to have any luck that gives us a little bit of an advantage in games but that was one. “Was it a sending off? Everyone will have their opinion; it wasn’t stonewall but that’s the thing that gave us a little shot in the arm, gave us the advantage and we win the game.